The morning of June 27th was clear and sunny, with the fresh warmth of a full-summer day; the flowers were blossoming profusely and the grass was richly green. The people of the village began to gather in the square, between the post office and the bank, around ten o'clock; in some towns there were so many people that the lottery took two days and had to be started on June 26th. but in this village, where there were only about three hundred people, the whole lottery took less than two hours, so it could begin at ten o'clock in the morning and still be through in time to allow the villagers to get home for noon dinner. The children assembled first, of course. School was recently over for the summer, and the feeling of liberty sat uneasily on most of them; they tended to gather together quietly for a while before they broke into boisterous play, and their talk was still of the classroom and the teacher, of books and reprimands. Bobby Martin had already stuffed his pockets full of stones, and the other boys soon followed his example, selecting the smoothest and roundest stones; Bobby and Harry Jones and Dickie Delacroix — the villagers pronounced this name “Dellacroy” — eventually made a great pile of stones in one corner of the square and guarded it against the raids of the other boys. The girls stood aside, talking among themselves, looking over their shoulders at the boys, and the very small children rolled in the dust or clung to the hands of their older brothers or sisters. The lottery was conducted--as were the square dances, the teen club, the Halloween program--by Mr. Summers. who had time and energy to devote to civic activities. He was a round-faced, jovial man and he ran the coal business, and people were sorry for him. because he had no children and his wife was a scold. When he arrived in the square, carrying the black wooden box, there was a murmur of conversation among the villagers, and he waved and called. "Little late today, folks." The postmaster, Mr. Graves, followed him, carrying a three- legged stool, and the stool was put in the center of the square and Mr. Summers set the black box down on it. The villagers kept their distance, leaving a space between themselves and the stool. and when Mr. Summers said, "Some of you fellows want to give me a hand?" there was a hesitation before two men. Mr. Martin and his oldest son, Baxter. came forward to hold the box steady on the stool while Mr. Summers stirred up the papers inside it. Mr. Martin and his oldest son, Baxter, held the black box securely on the stool until Mr. Summers had stirred the papers thoroughly with his hand. Because so much of the ritual had been forgotten or discarded, Mr. Summers had been successful in having slips of paper substituted for the chips of wood that had been used for generations. Chips of wood, Mr. Summers had argued, had been all very well when the village was tiny, but now that the population was more than three hundred and likely to keep on growing, it was necessary to use something that would fit more easily into the black box. The night before the lottery, Mr. Summers and Mr. Graves made up the slips of paper and put them in the box, and it was then taken to the safe of Mr. Summers’ coal company and locked up until Mr. Summers was ready to take it to the square next morning. The rest of the year, the box was put way, sometimes one place, sometimes another; it had spent one year in Mr. Graves’s barn and another year underfoot in the post office, and sometimes it was set on a shelf in the Martin grocery and left there. There was a great deal of fussing to be done before Mr. Summers declared the lottery open. There were the lists to make up--of heads of families. heads of households in each family. members of each household in each family. There was the proper swearing-in of Mr. Summers by the postmaster, as the official of the lottery; at one time, some people remembered, there had been a recital of some sort, performed by the official of the lottery, a perfunctory. tuneless chant that had been rattled off duly each year; some people believed that the official of the lottery used to stand just so when he said or sang it, others believed that he was supposed to walk among the people, but years and years ago this part of the ritual had been allowed to lapse. There had been, also, a ritual salute, which the official of the lottery had to use in addressing each person who came up to draw from the box, but this also had changed with time, until now it was felt necessary only for the official to speak to each person approaching. Mr. Summers was very good at all this; in his clean white shirt and blue jeans，with one hand resting carelessly on the black box. He seemed very proper and important as he talked interminably to Mr. Graves and the Martins. Mrs. Hutchinson craned her neck to see through the crowd and found her husband and children standing near the front. She tapped Mrs. Delacroix on the arm as a farewell and began to make her way through the crowd. The people separated good-humoredly to let her through: two or three people said in voices just loud enough to be heard across the crowd, "Here comes your, Missus, Hutchinson," and "Bill, she made it after all." Mrs. Hutchinson reached her husband, and Mr. Summers, who had been waiting, said cheerfully. "Thought we were going to have to get on without you, Tessie." Mrs. Hutchinson said grinning, "Wouldn't have me leave m'dishes in the sink, now, would you， Joe?," and soft laughter ran through the crowd as the people stirred back into position after Mrs. Hutchinson's arrival. "Dunbar." several people said. "Dunbar. Dunbar." Mr. Summers consulted his list. "Clyde Dunbar." he said. "That's right. He's broke his leg, hasn't he? Who's drawing for him?" "Me. I guess," a woman said. and Mr. Summers turned to look at her. "Wife draws for her husband." Mr. Summers said. "Don't you have a grown boy to do it for you, Janey?" Although Mr. Summers and everyone else in the village knew the answer perfectly well, it was the business of the official of the lottery to ask such questions formally. Mr. Summers waited with an expression of polite interest while Mrs. Dunbar answered. "Horace's not but sixteen yet." Mrs. Dunbar said regretfully. "Guess I gotta fill in for the old man this year." "Right." Sr. Summers said. He made a note on the list he was holding. Then he asked, "Watson boy drawing this year?" A tall boy in the crowd raised his hand. "Here," he said. "I m drawing for my mother and me." He blinked his eyes nervously and ducked his head as several voices in the crowd said things like "Good fellow, Jack." and "Glad to see your mother's got a man to do it." "Well," Mr. Summers said, "guess that's everyone. Old Man Warner made it?" "Here," a voice said. and Mr. Summers nodded. A sudden hush fell on the crowd as Mr. Summers cleared his throat and looked at the list. "All ready?" he called. "Now, I'll read the names--heads of families first--and the men come up and take a paper out of the box. Keep the paper folded in your hand without looking at it until everyone has had a turn. Everything clear?" The people had done it so many times that they only half listened to the directions: most of them were quiet. wetting their lips. not looking around. Then Mr. Summers raised one hand high and said, "Adams." A man disengaged himself from the crowd and came forward. "Hi. Steve." Mr. Summers said. and Mr. Adams said. "Hi. Joe." They grinned at one another humorlessly and nervously. Then Mr. Adams reached into the black box and took out a folded paper. He held it firmly by one corner as he turned and went hastily back to his place in the crowd. where he stood a little apart from his family. not looking down at his hand. "Allen." Mr. Summers said. "Anderson.... Bentham." "Seems like there's no time at all between lotteries any more." Mrs. Delacroix said to Mrs. Graves in the back row. "Time sure goes fast.“-- Mrs. Graves said. "There goes my old man." Mrs. Delacroix said. She held her breath while her husband went forward. "Dunbar," Mr. Summers said, and Mrs. Dunbar went steadily to the box while one of the women said. "Go on. Janey," and another said, "There she goes." "We're next." Mrs. Graves said. She watched while Mr. Graves came around from the side of the box, greeted Mr. Summers gravely and selected a slip of paper from the box. By now, all through the crowd there were men holding the small folded papers in their large hand. turning them over and over nervously。Mrs. Dunbar and her two sons stood together, Mrs. Dunbar holding the slip of paper. "Get up there, Bill," Mrs. Hutchinson said. and the people near her laughed. "Some places have already quit lotteries." Mrs. Adams said. "Watson" The tall boy came awkwardly through the crowd. Someone said, "Don't be nervous, Jack," and Mr. Summers said, "Take your time, son." After that, there was a long pause, a breathless pause, until Mr. Summers. holding his slip of paper in the air, said, "All right, fellows." For a minute, no one moved, and then all the slips of paper were opened. Suddenly, all the women began to speak at once, saying. "Who is it?," "Who's got it?," "Is it the Dunbars?," "Is it the Watsons?" Then the voices began to say, "It's Hutchinson. It's Bill," "Bill Hutchinson's got it." "Ready, Bill?" Mr. Summers asked. and Bill Hutchinson, with one quick glance around at his wife and children. nodded. "Remember," Mr. Summers said. "take the slips and keep them folded until each person has taken one. Harry, you help little Dave." Mr. Graves took the hand of the little boy, who came willingly with him up to the box. "Take a paper out of the box, Davy." Mr. Summers said. Davy put his hand into the box and laughed. "Take just one paper." Mr. Summers said. "Harry, you hold it for him." Mr. Graves took the child's hand and removed the folded paper from the tight fist and held it while little Dave stood next to him and looked up at him wonderingly. "It's Tessie," Mr. Summers said, and his voice was hushed. "Show us her paper. Bill." "All right, folks." Mr. Summers said. "Let's finish quickly." Although the villagers had forgotten the ritual and lost the original black box, they still remembered to use stones. The pile of stones the boys had made earlier was ready; there were stones on the ground with the blowing scraps of paper that had come out of the box Delacroix selected a stone so large she had to pick it up with both hands and turned to Mrs. Dunbar. "Come on," she said. "Hurry up." Mrs. Dunbar had small stones in both hands, and she said. gasping for breath. "I can't run at all. You'll have to go ahead and I'll catch up with you." 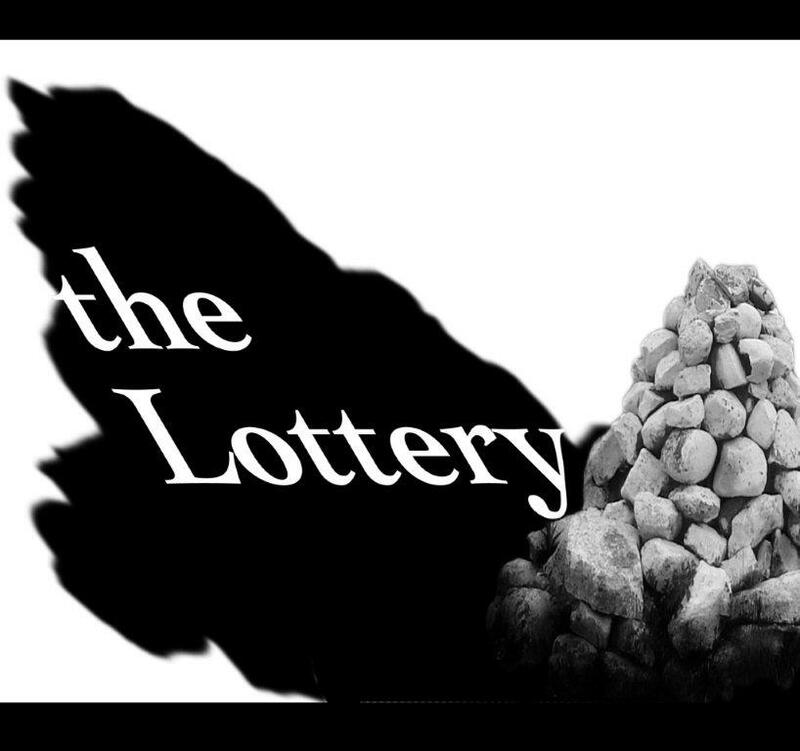 "The Lottery" is a short story by Shirley Jackson, first published in the June 26, 1948, issue of The New Yorker. Written the same month it was published, it is ranked today as "one of the most famous short stories in the history of American literature". It has been described as "a chilling tale of conformity gone mad." Response to the story was negative, surprising Jackson and The New Yorker. Readers canceled subscriptions and sent hate mail throughout the summer. The story was banned in the Union of South Africa. Since then, it has been accepted as a classic American short story, subject to critical interpretations and media adaptations, and it has been taught in middle schools and high schools for decades.